(04-28-2015, 05:22 PM) Tracer-X Wrote: Pictures of robot??? Video of the robot? Glad to see your working on the Toad again. Looks pretty fun and kind of addictive. 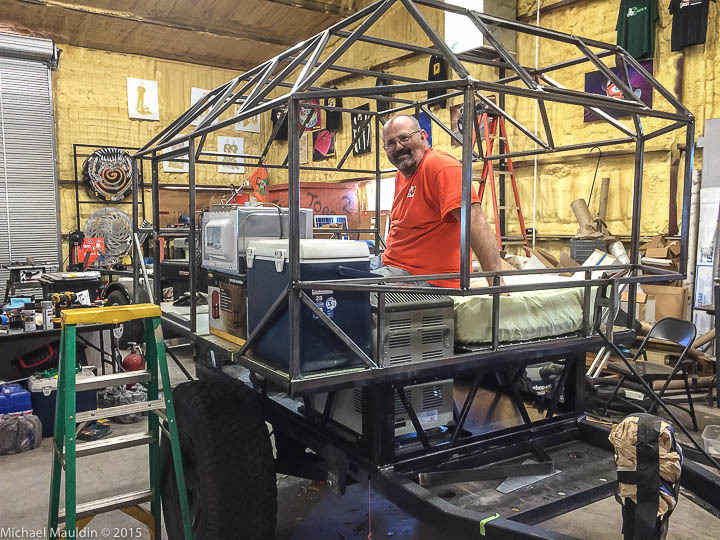 Goal weight is 1,800 pounds (trailer frame is rated for 2,000 as is the JK). The bed is small for two, but as big as I could fit on top of the existing Chaser frame. I didn't want the body wider than the distance between the outside of the tires, and I didn't want to modify the frame to make it longer. So the decisions were made for me. My hope is to get by with a slightly smaller bed because I can roll up against the outer wall. Weekend progress: got the door latch installed and the panel cut and drilled. 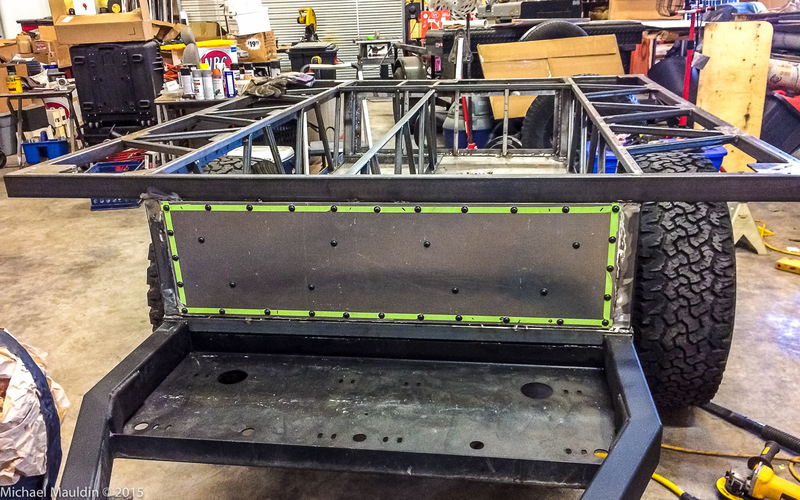 Also got the lower front trailer panel cut and drilled. 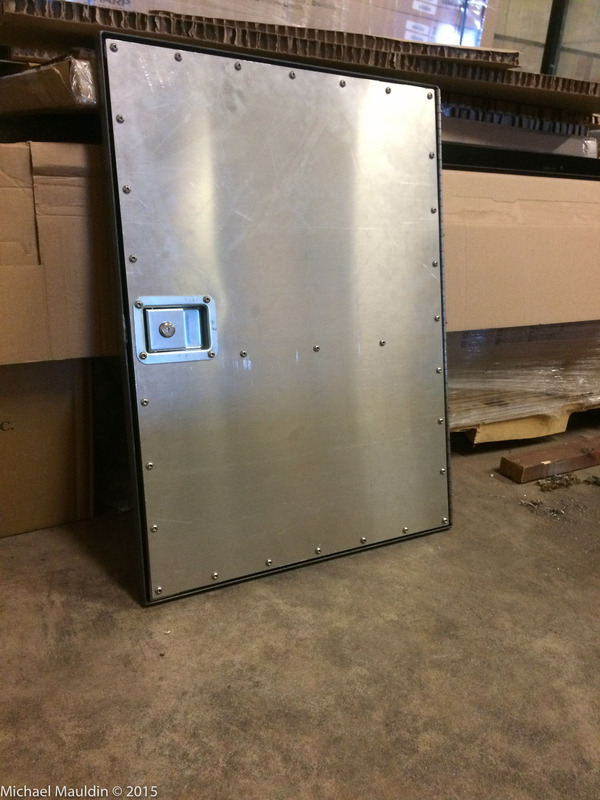 The door frame is 22" wide by 29" tall and made from 1" angle iron. 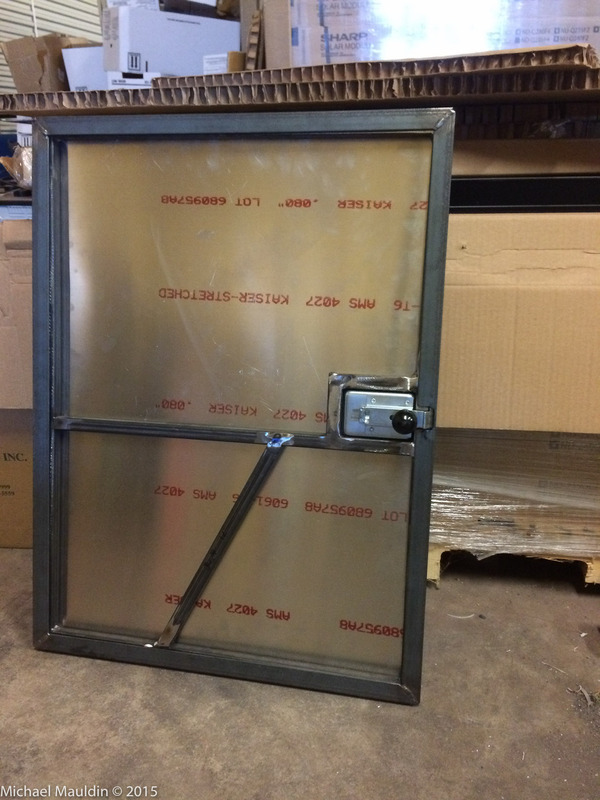 The door is made from 3/4" square tube with a 0.08" aluminum panel for the skin. The latch is for a horse trailer, but ought to work fine for my purpose. I may decide to add a window in the top half of the door, but haven't found anything I like. 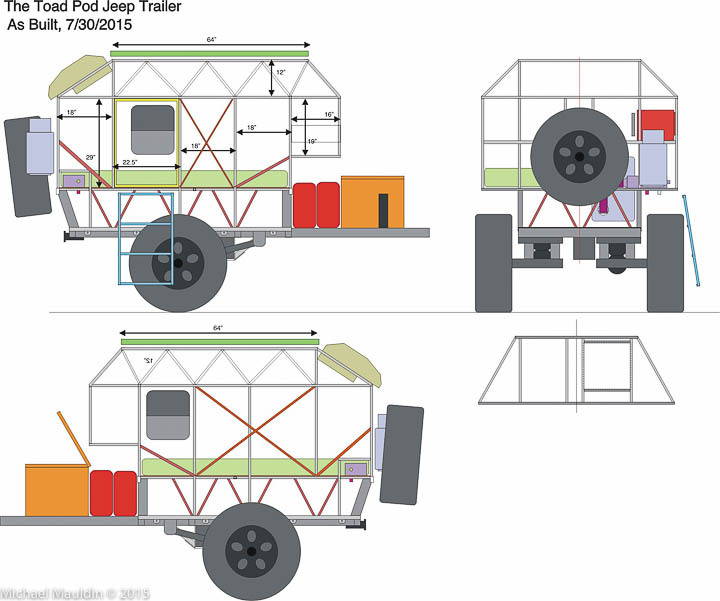 The wall of the Toad Pod™ is only 3/4" thick, and most trailer windows are for 2" thick walls. Because of the robot fighting I do, I have several hundred pounds of Lexan sheets lying around, so I can make my own windows if need be. I made the door from scratch because I couldn't find anything I liked in the right size. The lower side walls are built like a truss, with diagonal members to increase rigidity. There is a seam of 1" by 0.125" steel all the way around the edge of each panel. That meant a dozen or so little trapezoidal pieces of steel had to be cut and welded into place for each wall. I finished the last wall (the front) just today. Glad I'm done with the "fiddly bits". 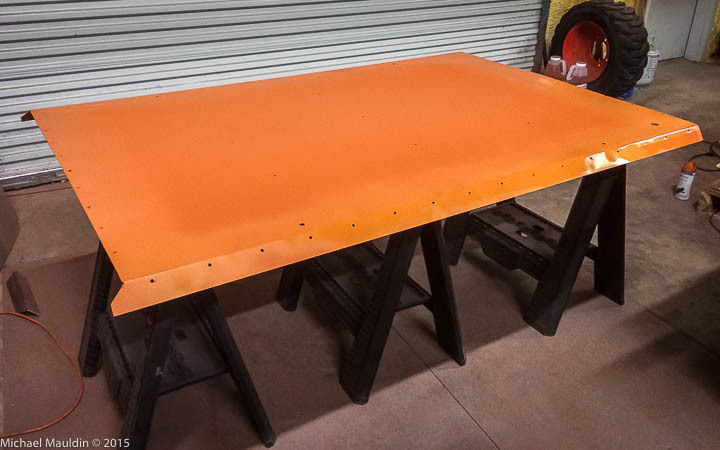 That panel has already been removed and primed, and will get two color coats tonight and tomorrow. 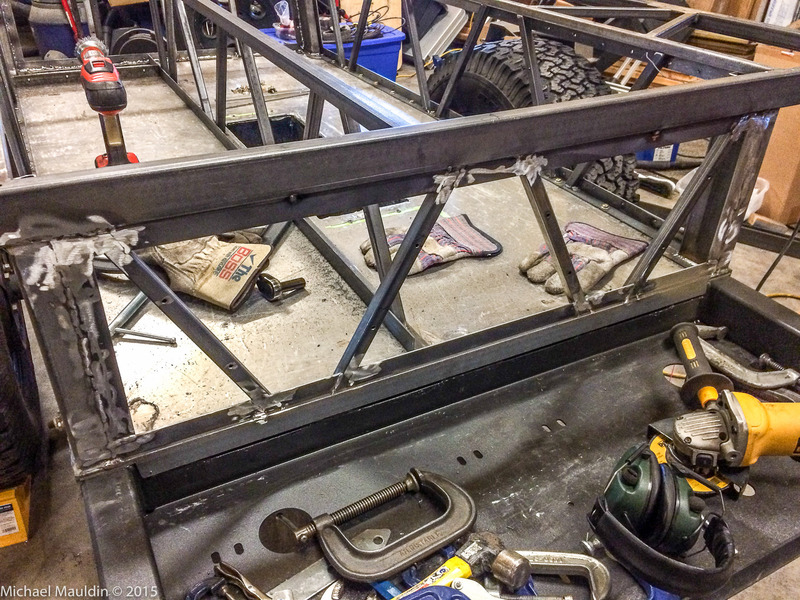 So far the trailer skeleton is only about half welded (the rest is tacked). 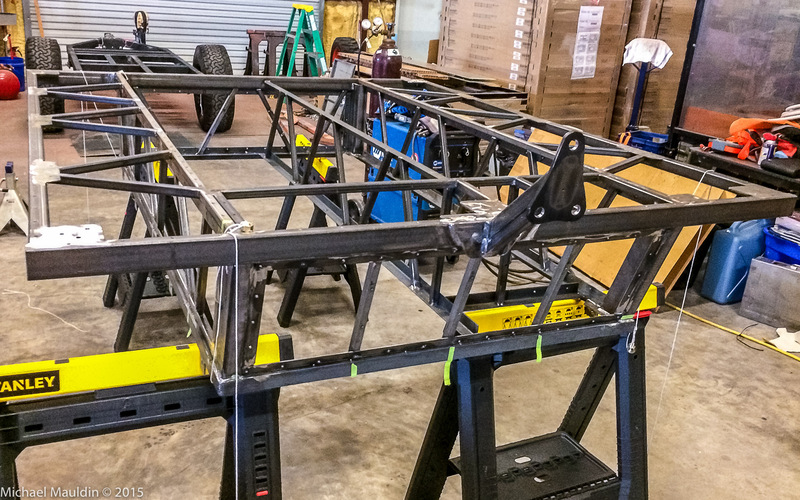 Next step is to remove the skeleton from the frame so I can flip it over and finish weld everything. I'm only working a few hours a day on it, so progress seems slow to me. I'll be glad to get this thing out on the trail. 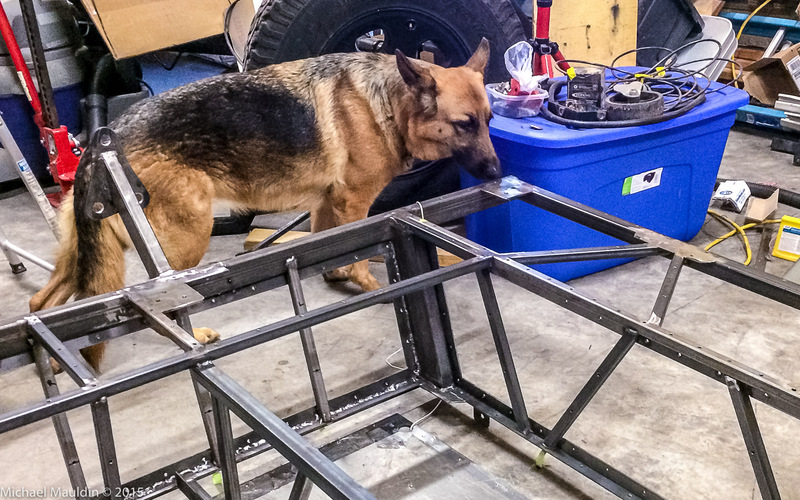 Part of shop safety is security, and my German Shepherd Frieda takes her job seriously. Every morning when I head to the shop, she goes in first and checks the whole building for bad guys (especially lizards). Then she checks out anything new or moved. Here she notices the freshly painted front panel. 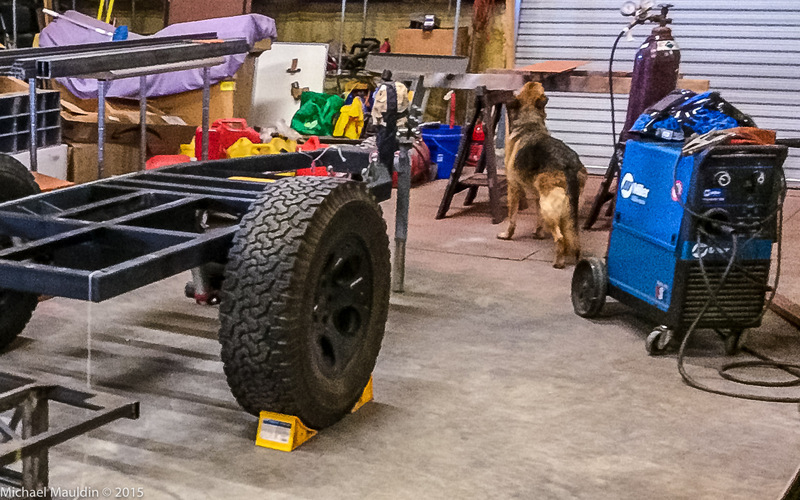 Here she checks the welds on the Toad Pod™ skeleton, which is now separate from the trailer frame. Once I was certified safe from lizards, she went back to the house, and I put the skeleton up on saw horses so I can do the finish welding. Once this bottom part is fully welded, I'll prime and paint it and then it will be mated to the trailer frame for good. Yes the morning lizards search is important! Was Frieda pointing out a weld that needed better penetration? Progress has been steady, even if reports to this forum have not. I usually put updates on my Facebook much more regularly, but you have to read all the other things I post.